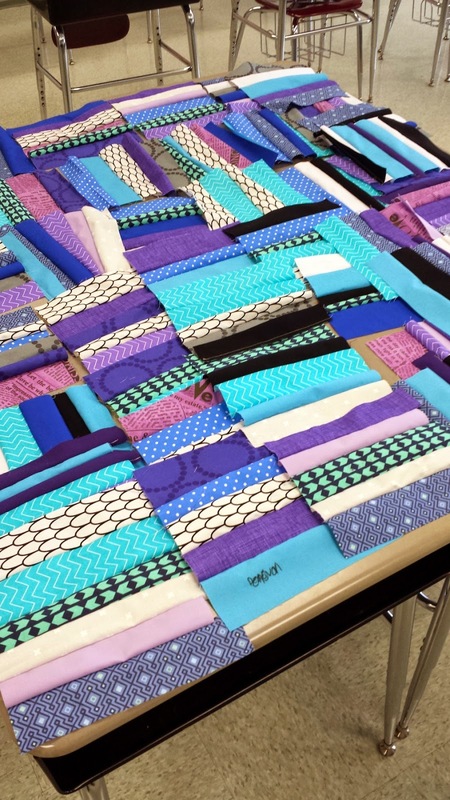 Something magical happens when you give kids a chance to play with fabric. They are fascinated by the many colors, the patterns, and the options. Plus, they always stretch the boundaries, and their creativity is endless. I highly recommend it! Earlier this month, I was given the opportunity to introduce and demonstrate quilting in my community for a second time in my school district (K-8)! For this free event, the PTA requested that artists create a class or interactive project if possible, and, after some thought, I decided it would be wonderful to make a special quilt for a 7th grader at our school who is battling leukemia. She hasn't been one of my own students yet, but I know that she likes the movie Frozen. So, I chose blues, blacks, whites, and purples that fit that theme. I had such a fun time choosing fabrics at Pennington Quilt Works (I may have been a bit giddy as I pulled fabric off the shelves without a care). My sister Marisa helped me set up the room (just like last year!) :). I precut the fabric and batting; basically, students chose 5-7 strips, filled a rectangular piece of batting, brought it to me to sew up, and had the option of watching how I work the machine. I found out quickly that there are a lot of Pearl Bracelet fans! Both boys and girls expressed interest in learning how to sew. It was invigorating. :) I didn't get any pictures of when the kids came in because it was madness; I was sewing and talking up a storm. We made about 80 quilt blocks that day! Both adults and kids could sign the large pieces of fabric for the back of the quilt - I now have four of these filled with names! Some highlights: my littlest former students (kindergarten/first grade) shyly shuffling in to say hello (with their wonderful parents). Telling some of the kids that my machine's name is Elsa and showing them the Frozen stickers that adorn its surface (I got lots of laugh and smiles!). The second grade girl who was watching right over my left shoulder and decided suddenly to help me guide the fabric through the machine (I slowed down a lot, and she insisted on repeating this process for each piece we sewed - SO cute!). The fascination over my knee lift by both kids and adults. My 5th through 8th graders coming in not only to make blocks and sign the backing but also to request more views of the "show way" I brought in for reading class. 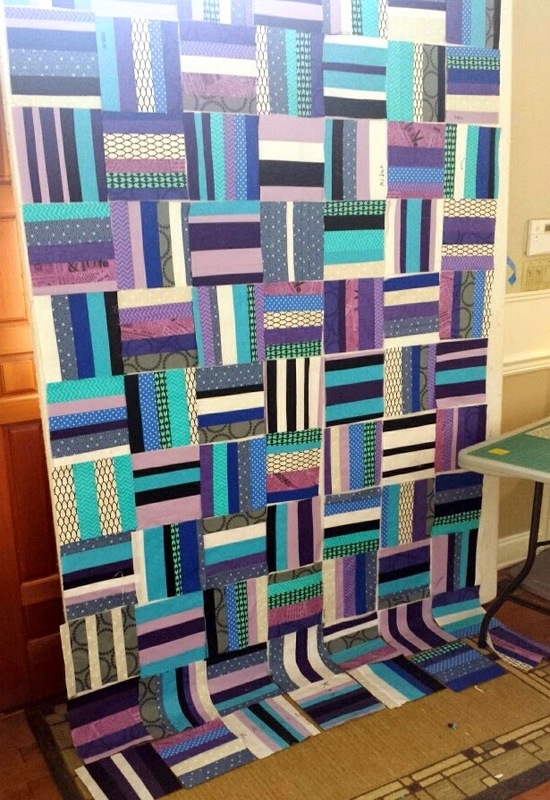 I laid out the top on Sunday, and finished piecing it together today! I let the squares (9 inches unfinished) fall relatively randomly (I tried to space out the all-solid blocks). The project and my time were generously sponsored by the Lopatcong Township PTA and the Warren County Cultural and Heritage Commission (thank you!). I'm hoping to be asked back next year to work with the kids again. Maybe we can make a quilt every year! What a fun project to organize and work on! Sounds like so fun playing with fabric and kids all day! I love their enthusiasm and fabric choices. Jessica what an awesome idea you came up with and what an experience for everyone involved. The end result is just awesome and I am sue the young girl will absolutely love it. 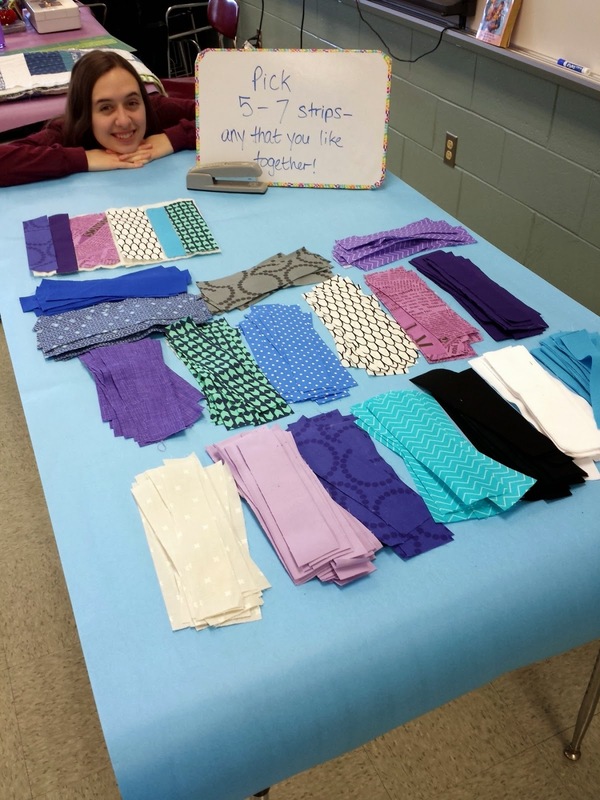 What a fab project- sure to please the recipient, and maybe even create a new generation of quilters. What a great story -- and experience. Your approach to get the kids involved is awesome. And, of course, the final product seriously rocks! Kids like to have an authentic reason to learn/do something. Making a quilt for a classmate is a perfect reason to make quilt blocks as they are introduced to sewing. Doing something for someone else is also a wonderful way to teach them the value of giving without expecting anything in return. If they keep having you back, the quilt could be for a raffle to get the money for a school project or maybe one for a local soldier who could use a quilty hug! Love that so many kids and adults are interested in learning to sew!! Fantastic, creative idea. The final product is gorgeous. That's a great experience all round - and a great looking quilt, a little like licorice allsorts! A few years ago I did a similar thing, but with smaller pieces, yours are a much better size and the interactions sound like fun. A wonderful inspiration for young people. What a great way to get everyone involved. Perhaps you've inspired some future sewers! The colors in the quilt are lovely!